A Dark and Stormy Night: Does Weather Affect the Paranormal? It was a dark and stormy night…. There is perhaps no introduction to a horror story as clichéd as this line, and with horror films there is also quite often bad weather involved as well, with thunder and lightning, darkness and rain. While this may be just for dramatic effect, there are enough instances of ghosts appearing during storms that one may begin to wonder if there is anything to it at all, whether there perhaps really is a connection between the ghostly phenomena and weather. In fact, it seems that there very well could be some influence on the paranormal from certain weather conditions, and this has actually become an area of serious study for some ghost researchers in recent years. The idea is not entirely far-fetched. After all, if ghosts, spirits, and other such entities do exist, then they must use some form of energy to do so or to manifest, for example, it is thought that ghosts sometimes utilize the ambient heat in a room for energy to manifest, leading to cold spots as this energy is abruptly absorbed. If they do need to suckle off of some sort of energy or “charge,” then this could theoretically be prone to fluctuations depending on certain atmospheric phenomena. 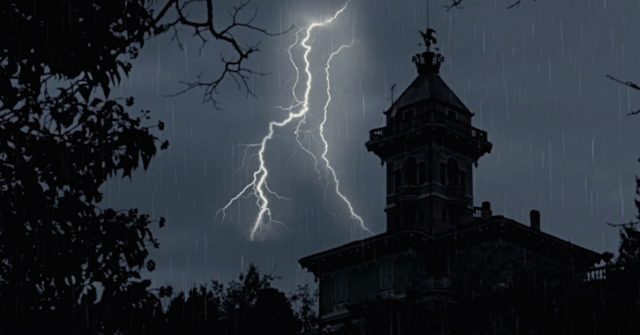 There are various types of atmospheric activity that could possibly affect the paranormal activity of a location, with the most common image of this being thunderstorms, so how would these storms be able to exert an influence on supernatural entities? There are actually several factors with thunderstorms that have been theorized to enhance or intensify activity. Perhaps the biggest factor is believed to be simply the sheer amount of electrical and electro-magnetic energy charging the air during storms. For instance, lightning is caused by the buildup of highly charged ions, and expend electro-magnetic energy fields when they release this energy. The humidity that is present during such storms is also important, because it is due to this humidity that the air becomes so charged in the first place, and the level of this humidity is linked to how much energy a storm can create and how much lightning is slashing across the sky. Also possible factors that could affect paranormal activity during storms are temperature and barometric pressure, which also have an effect on the amount of charge in molecules in the air, as well as wind, which is caused by the energy generated from a difference between pressure systems. With all of this humidity, thunder, wind, and lightning, all of these charged particles and electricity in the air, then if paranormal entities do exist and do rely on some form of energy to manifest in this plane, then it stands to reason that this charge could all give them a bit of a boost, and make them more visible or powerful than they would be at times of clear, calm weather. It all comes down to the amount of energy available to these entities, and whether there is a possible link between energy and ghosts. Indeed, so strong is the perceived connection between the atmospheric factors of storms and ghostly activity that many paranormal researchers consider the level of these elements to be important data, and carry equipment to measure them. Interestingly, this theorized relationship between available energy in the atmosphere and the manifestation of paranormal phenomena extends to other atmospheric conditions as well. A good example would be solar activity from our sun, which sometimes releases solar flares that set loose X-Rays, intense doses of UV radiation, and create what is called “solar wind.” This solar wind is composed of highly charged plasma particles that can lash out to reach all the way to Earth, where its electromagnetic energy is powerful enough to cause disruptions in the planet’s magnetic field called, geomagnetic storms. This electromagnetic energy hurled at us from the sun is powerful enough at times to affect electrical equipment on Earth, and this could all have an effect on paranormal phenomena as well. This is all very interesting speculation, and suggests that spirits and ghosts perhaps have actual physical rules governing their existence and abilities that could be influenced by the weather and atmospheric events, but it is also important to look at other natural explanations for why the weather might produce more reported paranormal activity. The most obvious one is simply that the spooky and rather ominous quality of storms, coupled with the long history of linking them to the paranormal in movies or books, may simply make for an atmosphere in which people more susceptible to perceiving perfectly mundane things for being supernatural. For instance, wind banging things around becomes anomalous noises, and a cold draft coming through becomes a cold spot generated by an entity. In this sense, during a dark storm with thunder and lightning outside and especially in a creepy place, we are essentially keyed up to perceive things as the work of ghosts. Paranormal activity witnessed during storms may also be caused by phenomena other than the supernatural. The most obvious example would be ultra-low frequency soundwaves, called infrasound. This refers to sounds that are just below the threshold of human hearing, but which nevertheless can produce a wide range of rather dramatic physical and psychological effects that are well-documented. These sub-sonic sounds can cause a myriad of physical symptoms, such as disorientation, dizziness, shortness of breath, faintness, increased heart rate and blood pressure, and nausea, as well as emotional and mental effects including fear, sorrow, panic, and anxiety, and also effects on perception, like both aural and visual hallucinations. Since the people experiencing these symptoms can’t actually hear the sounds that are causing them, they may be inclined to attribute them to a supernatural cause, especially if there is a trigger such as a spooky location. These infrasonic sounds can come from a wide variety of natural sources, including earthquakes, volcanoes, waves crashing upon rocks, wind, rain, and of course thunder. In some cases, these sounds can even be amplified by traveling over features of the landscape or passing through and resonating about certain structures or tunnels, which could explain why some locations are so prone to “hauntings.” Indeed, many haunted locales have been found to be in areas with persistent infrasound reading, to the point that it is considered an explanation in some cases even by paranormal investigators. Since many weather events such as wind and storms can cause infrasound, this could be a plausible rational link between weather and the paranormal. Other than infrasound, there are other weather phenomena that could cause people to mistake what they are seeing as something supernatural as well. The most notable and mysterious is probably ball lightning, which although still largely misunderstood is a recognized natural phenomenon and takes the form of orbs of light that dance, streak, bob about, and even enter structures or pass through walls, and also can last up to several minutes in duration unlike regular lightning. Ball lightning is so weird and unpredictable that it even sometimes exhibits what almost seems to be intelligent behavior, and it has been used as an explanation for UFOs and of course ghosts. Another weather phenomenon that could be misidentified as something paranormal in nature is what is called St. Elmo’s Fire, which appears as a bright glow at the edge of pointed objects and is caused by a grounded object conducting the electricity of the air to ionize the air molecules around it. So does the weather have any effect on paranormal activity, or is this all just natural phenomena causing misunderstanding and misidentification? Right now we simply don’t know, but there has been such a high level of correlation that many ghost hunters take the weather and atmospheric conditions into account in their research of any given haunted place. Although it is far from something we can hope to understand any time soon, this correlation might be worth pursuing in the future, and it sure does give one something to think about if you are ever up on a dark and stormy night. Interesting - ghosts and such much need "extra" energy to materialize. Makes sense to me (as a possibility). I haven't heard about this theory lately, but for awhile there were sightings of UFO above high power electrical towers and such. There was a theory that the black out on the east coast of USA and Canada: www.ufoinsight.com/east-coast-power-blackout-1965-ufos-blame/ was caused by one or more UFO's drawing on the system and tripping a breaker. I don't know if there are more UFO sightings on clear or cloudy/stormy nights. I would say clear, because people can see farther up into the sky. But if a UFO is flying stealth and low, cloudy and lightening might be better. This less about weather affecting the paranormal; more about the paranormal benefiting from having a stormy sky to disappear into. Or charging up from power lines. Seems I can't stay on topic but I just want to say that when I levitate, and especially when I'm learning to in dreams, the power lines are very dangerous. I float towards them under I am under them and need to get free but they are "sticky". They attract me and I struggle to clear them. Maybe ghosts and such are attracted to the charged condition in the air during storms and even lightening. There! I tied it together.